Modern states have evolved as complex political structures in which unitary forms of government maintain an uncertain equilibrium with ethnically plural societies. Historically, ruling elites have tried with little success to eradicate ethnicity through genocide, bury it under accusations of tribalism, discredit it with the mind-frame of modernization, or confine it to local rather than national political arenas. This broad-ranging volume examines the dynamics of ethnic manipulation and accommodation by dominant and subordinate groups in the state-building process. Ethnicity and the State reflects the widely varying political contexts and cultures in which reasons of state contend with unyielding ethnic allegiances. European, South American, Asian, and Middle Eastern examples reveal a consistent set of themes and attitudes. 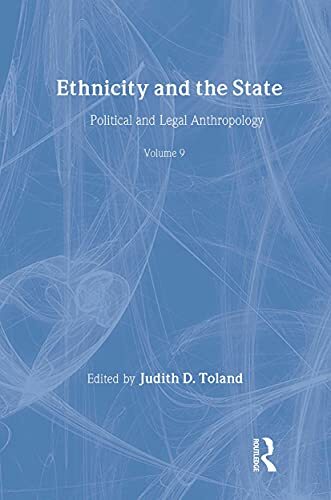 The authors find that while the state must realize its authority and stability through a strictly defined charter of rights and values, ethnic identity exercises its power more freely and flexibly. The sense of peoplehood may be artificially constructed in response to immediate need, or it may be ancient and organic, growing over time. It has the potential to cut across race, class, and gender. Its central tenets and myths may be reinterpreted, recreated, enlarged upon, or modified as the political situation warrants. Flexibility of belief and the need to identify with a larger group account both for the durability of ethnic loyalty and its vulnerability to manipulation. This volume is particularly timely at a moment when national governments in many parts of the world must face the adoption of more equitable forms of rule to hold their ethnically diverse societies together. Taken together, the analyses presented here warn against institutionalizing ethnic strife and offer a vision of how the state may foster expectations and policies that serve the interests of all ethnic groups within their borders. Political scientists, historians, and anthropologists will find this book valuable for its interpretations of forces that continue to reshape the social and political fabric of the world. Judith D. Toland is senior lecturer in the University of Wisconsin Center's Post Secondary Reentry Education Program. She is currently working on a study of incarceration and the maintenance of dependency in the correctional system.